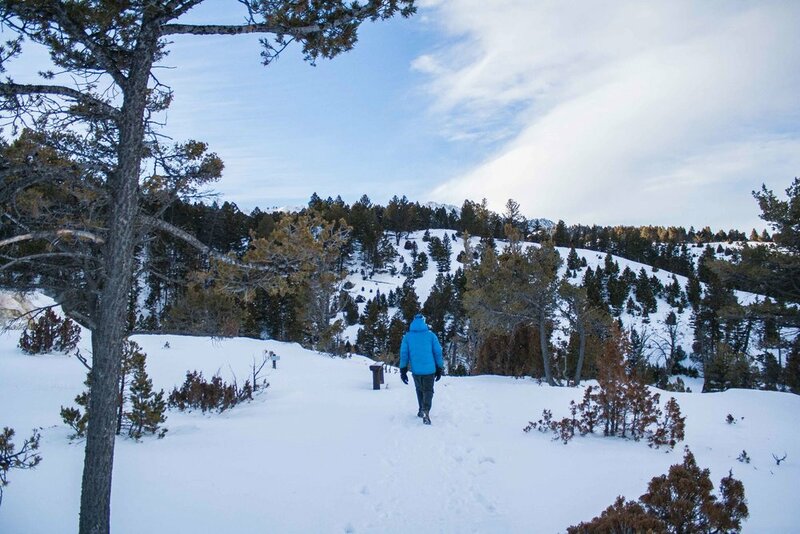 Since we always enter from the northern entrance, by the small town of Gardiner, we get access to the most northern part of the park in the wintertime. 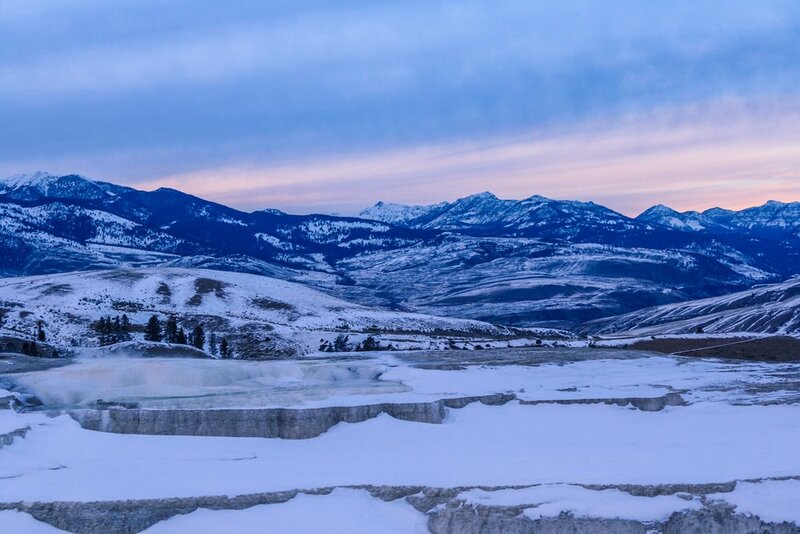 Though you can’t get to Old Faithful with the car, you can get to Mammoth Hot Springs. If you can’t go to Yellowstone at all, you can always tune in to one of the many webcams that the national park service provide. 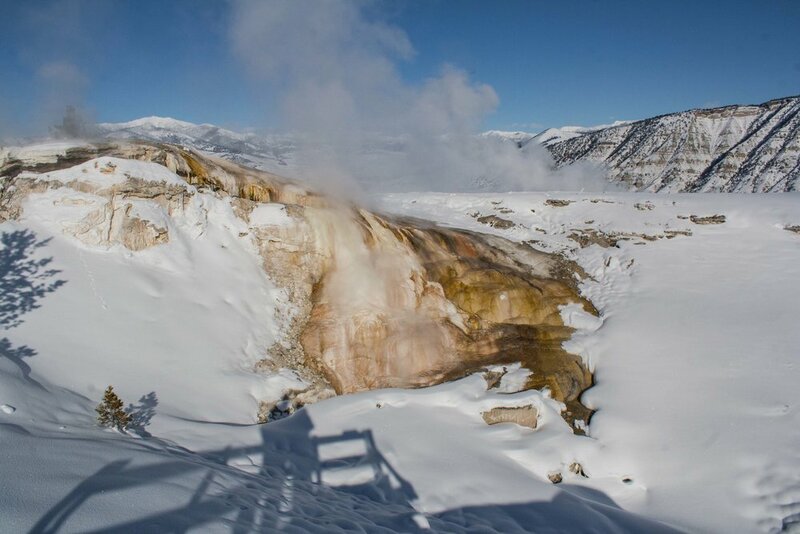 There are several covering the northern part, and one of them can be found by the Mammoth Hot Springs. 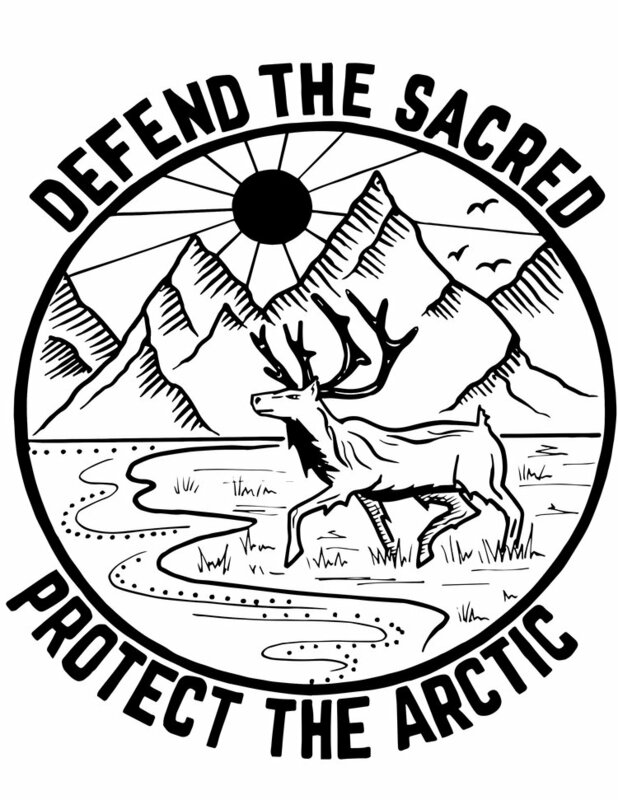 Precipitation (both rain and snow) that falls on the surrounding mountains slowly makes its way down through the soil and continues deep belowground. 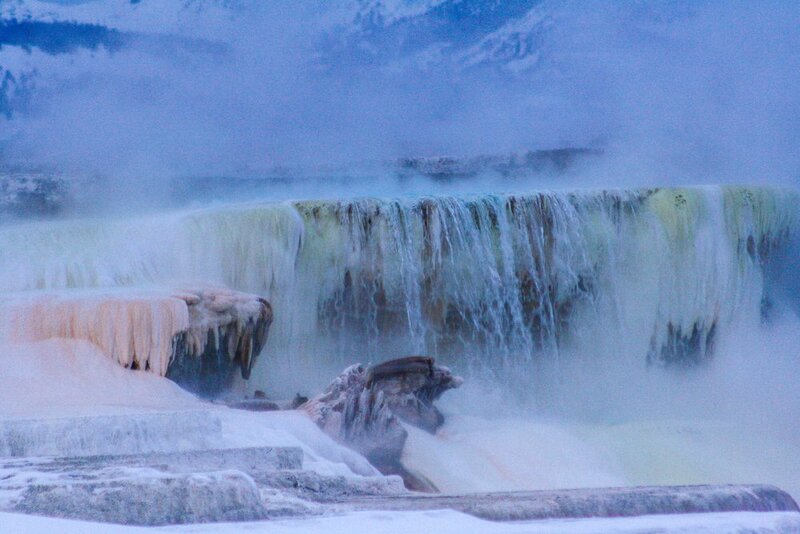 Eventually the water is heated up before it finally sees daylight again when it leaves the deeper soil and is forced upward and creates the Mammoth Hot Springs. 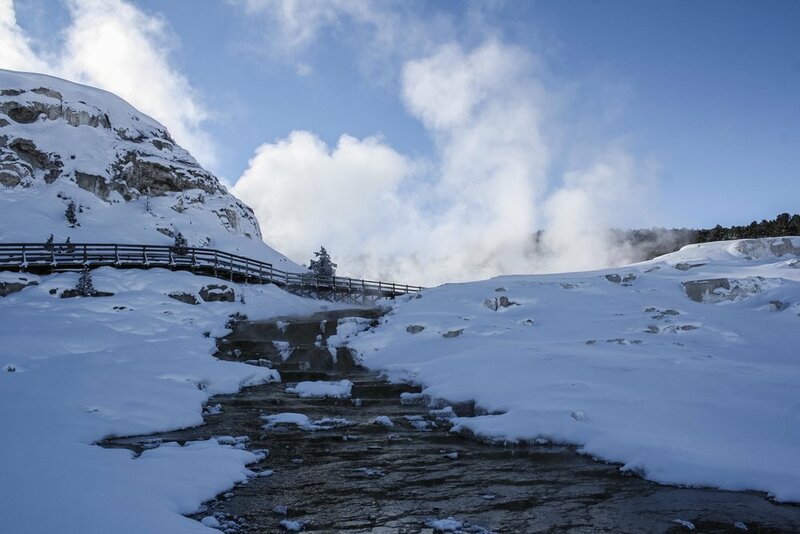 The park is maybe mostly known for its thermal hot springs like the Old Faithful. The hot springs create a specific microhabitat that allows certain species to thrive, but if you go up in elevation you will find the fragile alpine flora and a completely different microhabitat. 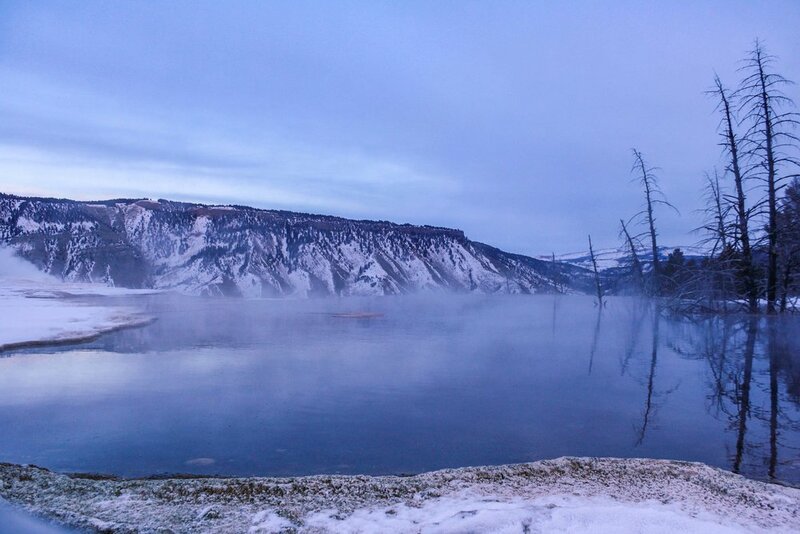 Yellowstone is part of the Rocky Mountains, which extends all the way up through Canada. The park is one of the oldest National Parks in the US, and became the nations first National Park in 1872. Within the park you will find the Washburn Range and the Red Mountains Range. 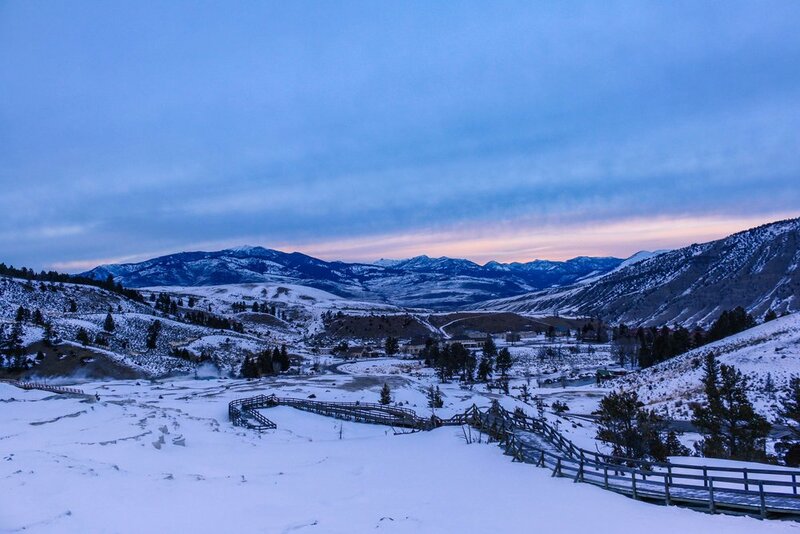 The northwest corner is covered by the Gallatin Range which starts north of the park, around Bozeman, MT. In the northeast corner you have the Absaroka Range that follows the Montana-Wyoming border and make up the eastern border of the park. It’s pretty cool to see the art that constantly forms with the combination of hot steam and cold air. 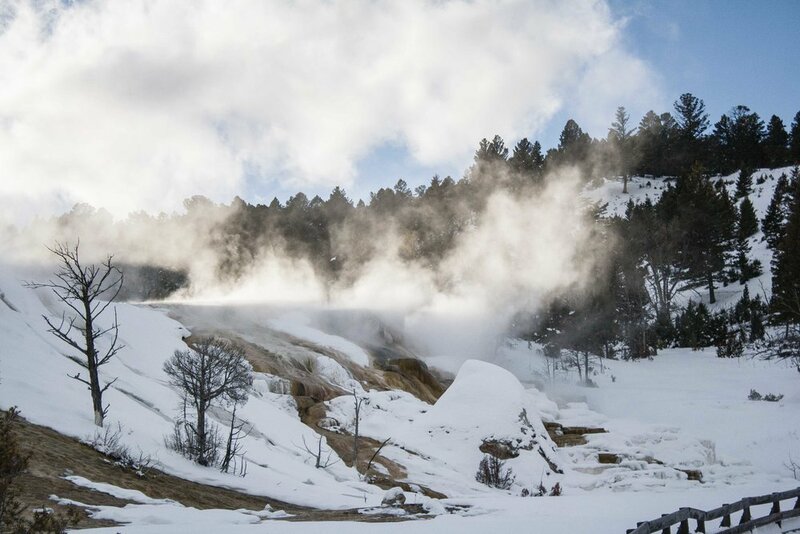 Snow and ice surrounding the hot springs makes for the perfect art formation. 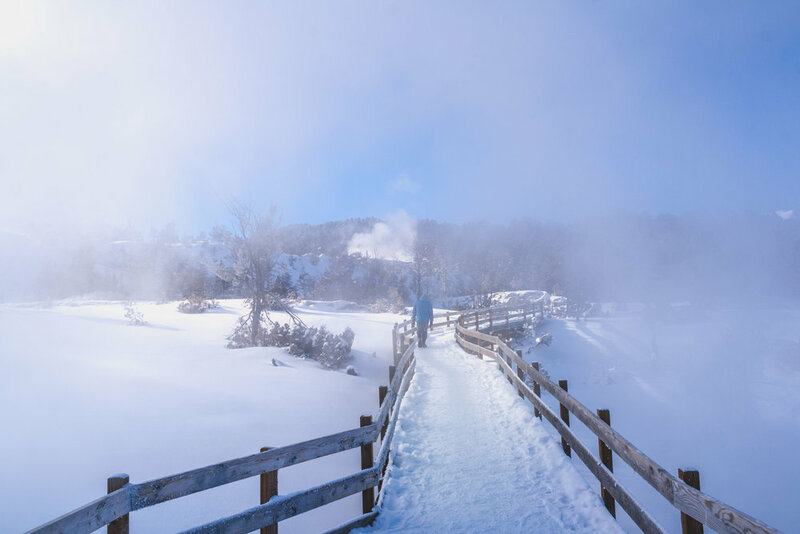 The hot springs at Mammoth are one of the most accessible hot springs in Yellowstone National Park. They are just a few miles from the entrance in Gardiner which makes for an easy excursion. 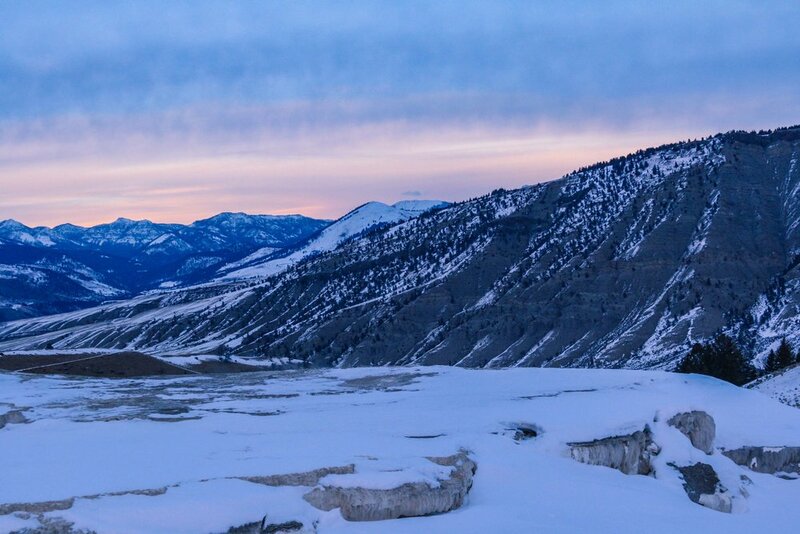 The bedrock underlying Mammoth Hot Springs mainly consist of limestone. When the deep water slowly makes its way upwards it has formed carbonic acid (due to the carbon dioxide that the water has collected belowground) which dissolves the limestone and forms calcium carbonate. 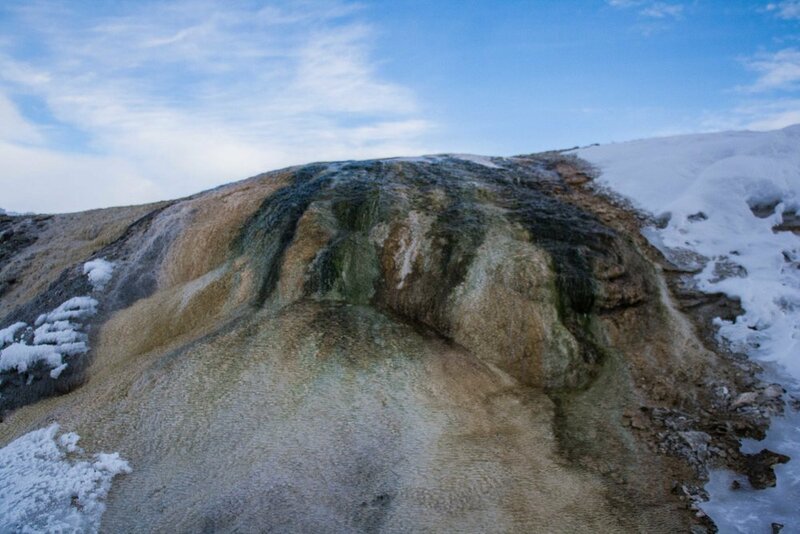 When the calcium carbonate finally reach the surface it is deposited and forms travertine which is the rock that forms all the terraces at Mammoth Hot Springs. The hot springs constantly change and that is one of the greatest things about them. Either the flow of the water changes dues to freezing temperatures, or tectonic changes belowground triggers the water to change its route and sometimes even its temperature and other characteristics. Some of the hot springs even dry out for several decades, before they start to flow again. There have also been times when the hot springs flow has increased so much that the boardwalk gets under water. 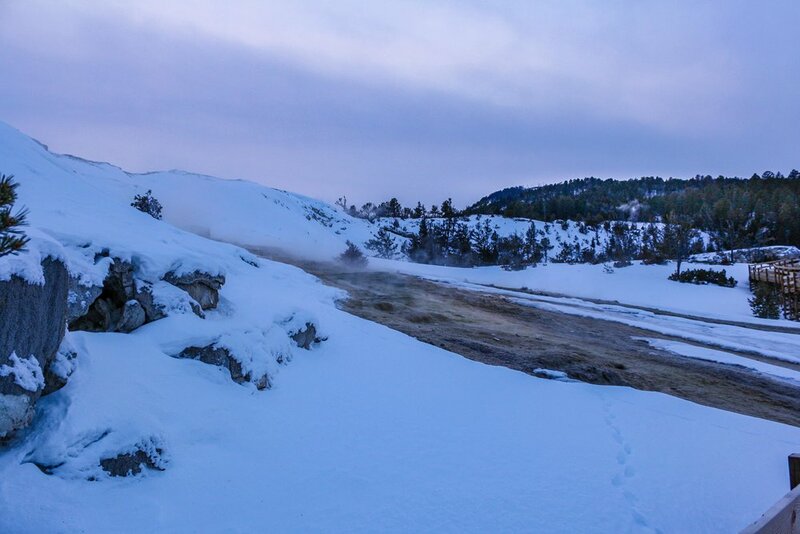 If you can time your excursion through the hot springs with some sunset or sunrise you should. 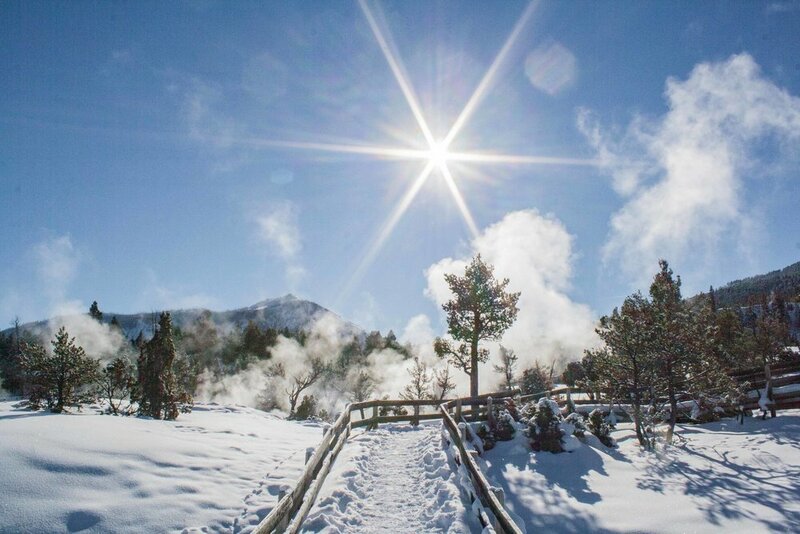 The colors of the sky will reflect in the hot springs, and that is always amazing to see. It will be a completely different experience compared to the daytime excursion. 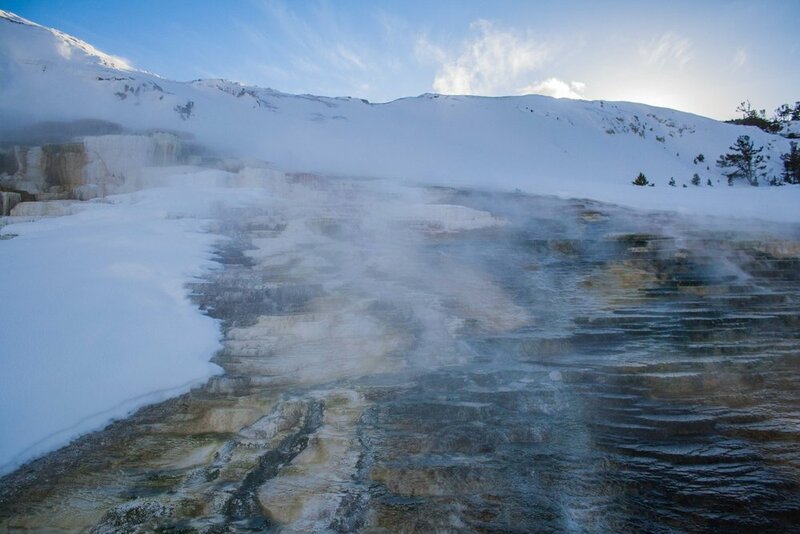 The color of the hot springs themselves, blue, orange and green are caused by differences in temperatures and pH which allow for different bacteria to thrive and live there. Another good thing about freezing temperatures, other than all the art that is created, is that a lot fewer people will venture out at all. If its 10 or 20 below no one will be here. 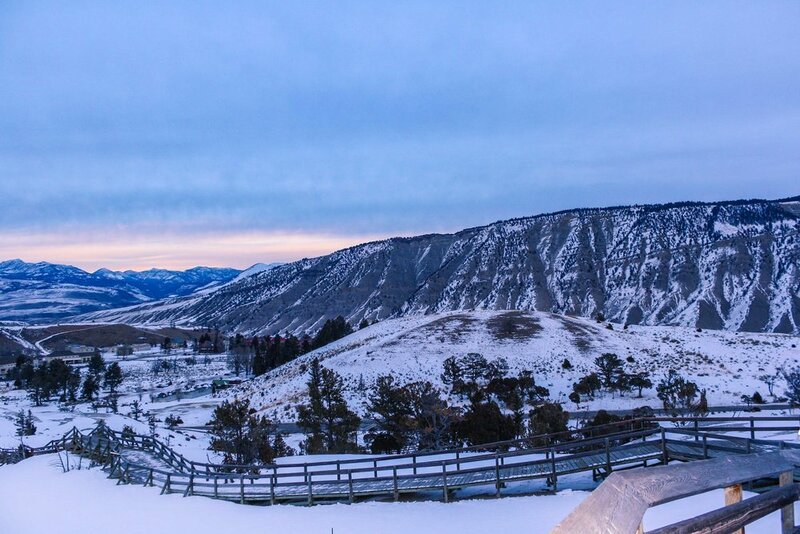 Mammoth hot springs consist of two levels, the lower and upper terrace. Small parts of the area is wheelchair accessible, but to get to the upper terrace you either have to walk up some stairs, or access it from a different road, which I think is closed in the wintertime. Either way, if you are able to walk around you definitely should check out all the different springs at both the lower and upper terrace. 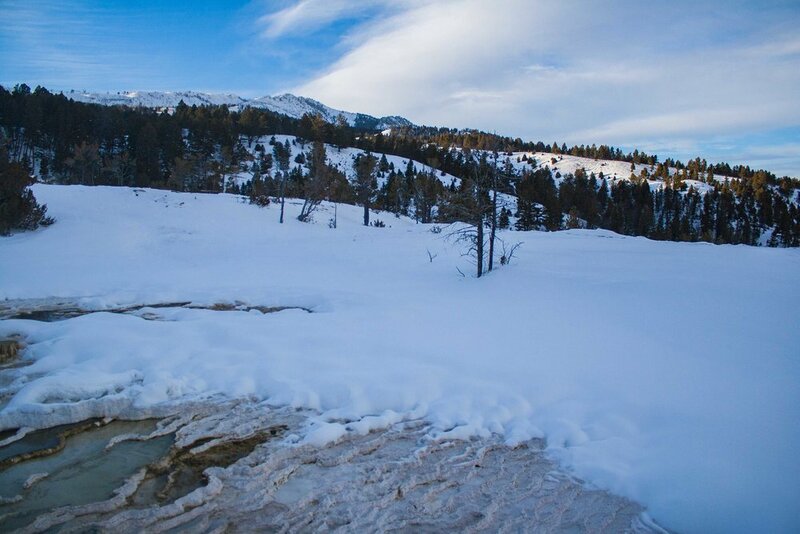 You might see less of the different hot springs after a big dump of snow, so that might not be super fun. The photos below are all from the upper terrace level. All the photos above is sort of a mixture of all the different springs on both the upper and lower level. 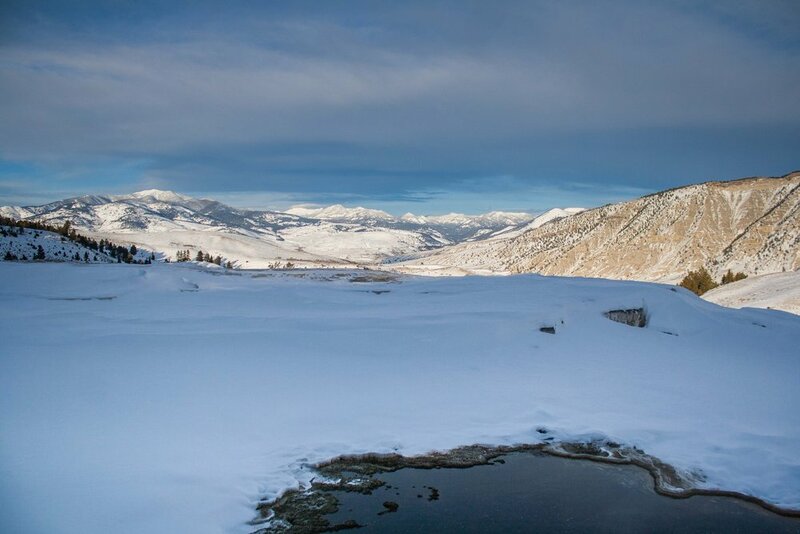 Have you ever seen Mammoth Hot Springs in the wintertime? 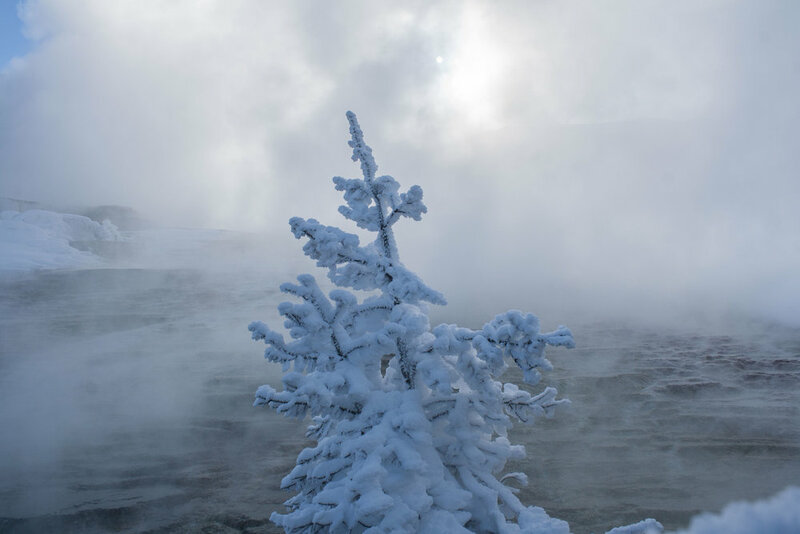 Posted on February 5, 2019 by Ann Rumbleinthearctic and filed under Yellowstone, Adventure Tuesday, The great wide open and tagged Yellowstone Yellowstone National Park Winter Wonderland winter sun 2019 Mammoth Hot Springs Hot Springs Winter Adventures Wintertime Winter Edition.